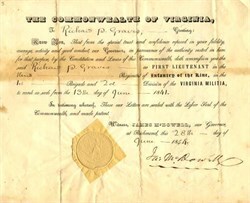 Certificate to recognize Richard P. Graves as the first lieutenant in the third Regiment of Infantry of the Line, in the 1st Brigade and 2nd division of the Virginia Militia dated 1841. This certificate is hand signed by Virginia Governor James McDowell, who was Virginia's Governor from 1843-1846. McDOWELL, James, statesman, born in Rockbridge county, Virginia, 12 October, 1796; died near Lexington, Virginia, 24 August, 1851. His father, James, was descended from Ephraim McDowell, an early settler in Rockbridge county. His mother, Sarah Preston, was the sister of General Francis Preston, whose daughter the younger James McDowell subsequently married. He was graduated at Princeton in 1817, and engaged in planting till 1831, when he was in the Virginia legislature and took high rank as an orator. During this session he advocated the gradual manumission of slaves, and also supported in a series of brilliant speeches measures for internal improvement and the public-school system by extra legislative appropriation. He was governor in 1843-1846, received the degree of LL. D. from Princeton in 1846, and in the latter year was elected to congress as a Democrat, serving till 1851. Although an advocate of state rights, he vehemently opposed slavery, and is said to have done more to impress upon the south the superior economy as well as philanthropy of abolition than any other from Jefferson till his own day. When the extremists demanded that California should not be admitted as a free state without an equivalent in the extension of slave territory, he addressed the house in a speech on that subject, on 3 September, 1850, that was unanimously described by those present, of whatever party, as one of the most eloquent efforts that had been heard in congress. A contemporary writer says: " His tall form, graceful gestures, and commanding voice revived the expectations formed of his fame. His sustained and splendid appeal confirmed them. The house repeatedly broke into involuntary applause. At the conclusion of his hour it shouted ' Go on !' a proceeding hitherto unknown in the history of congress. At the conclusion all business was suspended, and the house adjourned almost in silence."